How many Destros do you own? I apparently own five at this moment. I did have a smaller 3 3/4" Destro of the 12" model Destro, but sold it to make room for more of the 3 3/4" Destros. 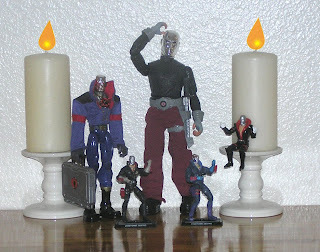 I did once have an original Destro, but its lost with the tests of time. I really only wanted one Destro of the 25th Anniversary Destros, but when a chromed domed version came out, I jumped. 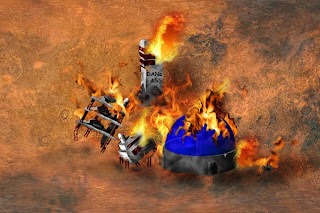 Then I learned a more carton accurate Destro with a Weather Dominator is also coming out! Gotta get that Destro too. But REALLY, how many Destros do I need. This is getting silly? By the way, my favorite of the Destro Five is the one with the Mickey Mouse gloves. See if you can find it! How many Storm Shadows do you own? I apparently own four at this moment. 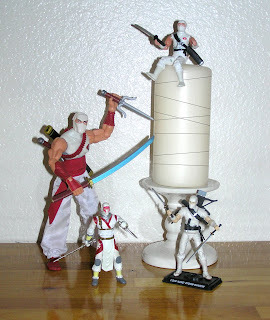 This is the most Storm Shadow's I have ever had at one time. Storm Shadows are difficult to photo in a group shot. As you can see, the Storm Shadows betooken many slices at the decorative candle on the set. Coincidentally, I just read the Marvel GI Joe comic #21, when Storm Shadow was first introduced. Storm Shadow battles Snake Eyes and there are no text bubbles or talking at all in the story. Must be a ninja thing. How many Zartans do you own? I apparently own three at this moment. 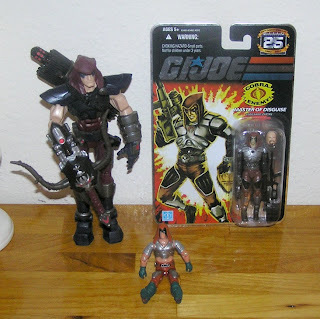 Might have sold a past Zartan to make room for a different Zartan. Truthfully you can't really own a Zartan. He is a Zartan with his own dreams and goals too. As for Zartan's hood/hair, that is up for debate. I was using a coworker's computer a few times while he was out on vacation. Instead of wasting the constant travel time, rolling my chair from half of one side of the room to the other, I built a colony on the desktop to stay at. It was a fine Utopian city, with no strangers. We had a working monorail inside the dome, Dental plan, and a lovely bacon festival every third Tuesday. Things were good. Then my friend came back from vacation, and sadly, retook the colony. 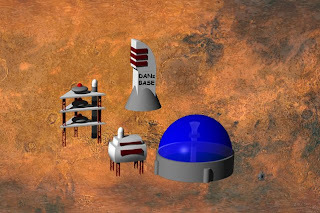 I will remember Dan's base for the good times.